This formula combines a comprehensive array of studied technologies to target multiple signs of aging at once. The technologies are direct Copper Peptides, also known as GHK-Cu (Copper Tripeptide-1), Matrixyl 3000 peptide complex (with palmitoyl tetrapeptide-7), Matrixyl synthe'6 peptide complex (with palmitoyl tripeptide-38), SYN-AKE peptide complex (with dipeptide diaminobutyroyl benzylamide diacetate), Relistase peptide complex (with acetylarginyltryptophyl diphenylglycine), ARGIRELOX peptide complex (with acetyl hexapeptide-8, pentapeptide-18) and a Probiotic complex (with Lactococcus lactis lysate), solubilized in a base of 11 skin-friendly amino acids and multiple forms of hyaluronic acid.The "Buffet" Copper Peptides 1% formula differs from our original "Buffet" as this formula includes a 1% concentration of pure Copper Peptides, increasing its focus on overall skin health. The natural role of these peptides as found in human plasma includes supporting a wide range of skin health functions like maintaining normal immune function, collagen synthesis, fibroblast production and anti-inflammatory responses. 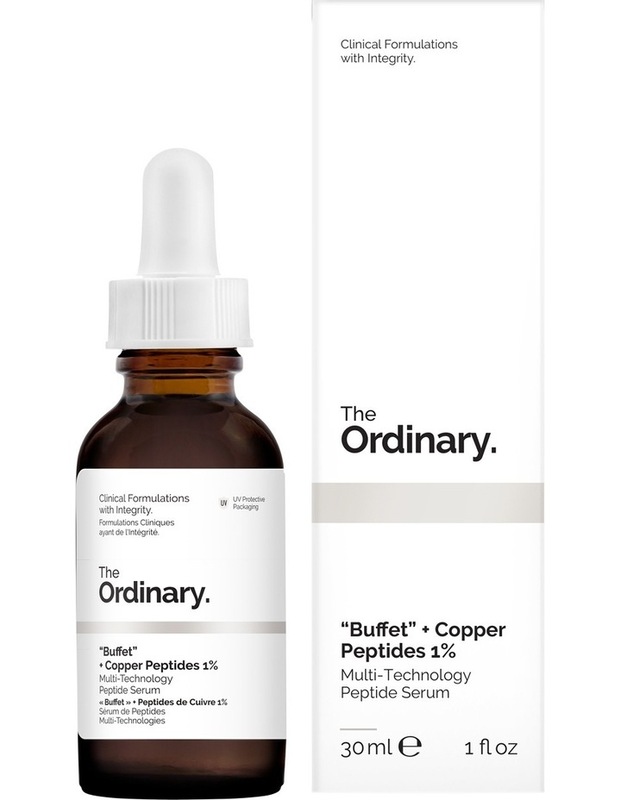 The inclusion of Copper Peptides offers a natural blue tint to the formula. The total concentration of active technologies in this formula is 26.1%.